For any dental practice to get noticed—and patronized—in today’s oversaturated marketplace, it’s just not enough to blend in. Me-too-isms won’t cut it. Fitting in is a sure way to obscurity. You’re either extraordinary or invisible. In a word: RADICAL. 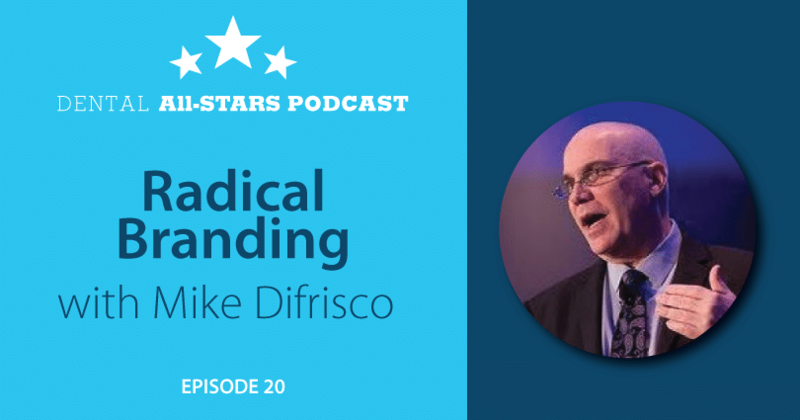 This podcast will explore the steps that will lead your dental practice from brand obscurity to brand notoriety. Because the biggest risk of all is playing it safe. Michael DiFrisco was the Chief Marketing Officer for the American Academy of Cosmetic Dentistry (AACD). He is also a brand strategist, and can help YOUR dental brand to find its focus, its differentiating factor, and give your patients and prospects reasons to support your practice and become evangelists for you.